Creating whimsical art with flowers, veggies and other materials is a way for me to share what I love! Work in the fashion industry in NYC and graduate studies in architecture eventually lead me back to what I did as a kid - drawing pictures of ladies in fancy dresses and playing with my food! 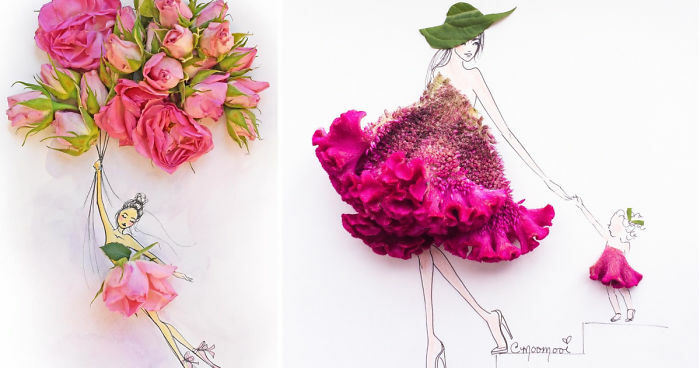 The Moomooi fashion illustrations I call "Some Flower Girls" have taken up a life of their own. Nowadays I create content for clients like Coach, Grey Goose, Patron, CosmoGirl, Pantone, Soho House and Tory Burch. Everyone needs a little escape in their everyday lives. Hearing that someone smiles in reaction to what I share makes my work worthwhile. The Bow on the little girl's head looks cute! Sprouts are-for once- appealing ! This is beautiful. You are so talented, Meredith. Gorgeous! Like a beautiful bride. I want to upvote more!